We present a case of a 55-year-old woman with episodes of recurrent pulmonary edema that was diagnosed to have a large left atrial myxoma using bedside transthoracic echocardiography. This case illustrates the importance of a screening focused ultrasound examination of involved systems by emergency physicians in detecting causes for emergency clinical presentations. Left atrial myxomas often present with one or more effects of a triad of obstructive, embolic and constitutional manifestations. We present a patient with recurrent pulmonary edema who was diagnosed to have a large left atrial myxoma using bedside transthoracic echocardiography in the emergency department (ED). A 55-year-old woman with no past medical problems was referred to our ED from a local hospital with acute pulmonary edema. She was seen in that hospital twice previously with episodes of acute pulmonary edema that was treated with intravenous diuretics. She had an appointment with cardiologist after a month. Clinical examination revealed normal vital signs, normal JVP, bibasilar rales and a very faint mid-diastolic murmur heard at the apex of the heart without an opening snap. Her ECG was normal. Chest X-ray showed no cardiomegaly but there was pulmonary congestion. In view of recurrent pulmonary edema in the absence of obvious causes for pulmonary edema and a long waiting for cardiologist consultation, a bedside transthoracic echocardiographic examination of the heart was performed using the ATL HDI 5000 machine to rule out any gross abnormalities in the heart. Bedside transthoracic echocardiographic examination showed a large rounded mass protruding from the left atrium into the left ventricle [Figure 1] and [Figure 2]. This mass was relatively fixed at mitral valve causing diastolic obstruction of mitral inflow and 'functional' mitral stenosis leading to recurrent pulmonary edema. The mass seemed to be attached to lower part of interatrial septum and the echocardiographic appearance of the mass was pathognomic of atrial myxoma. The patient underwent urgent surgery to remove the mass. At surgery interatrial septum was intact with an 8×4 cm mass seen attached from low interatrial septum with a small pedicle and occupying whole of mitral annulus. The mass was excised from the atrial septum which was secured by a patch closure. It weighed 64 gm and the histology of the specimen showed abundant hyaline and myxoid stroma containing small groups of tumor cells, compatible with the diagnosis of atrial myxoma. 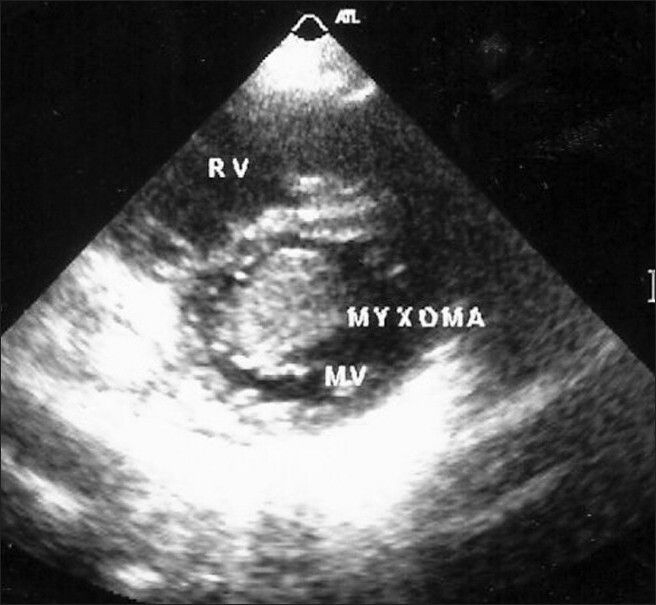 Intracardiac myxomas are the most frequent benign tumor of the heart, with the majority (>80%) located in the left atrium. In the left atrium the usual site of attachment is in the fossa ovalis. Less common sites within the left atrium are the mitral valve or in areas near it. Left atrial myxomas often present with one or more effects of a triad of obstructive, embolic and constitutional manifestations, although some are asymptomatic. They may be small or large and either immobile and nonprolapsing or mobile and prolapsing through the mitral valve. In our patient, a large left atrial myxoma was originating low in the interatrial septum near the mitral valve, was prolapsing through the mitral valve but immobile causing 'functional' obstruction to mitral valve causing recurrent pulmonary edema. In most centers of developing countries, ultrasound imaging of patients presenting to ED is performed by radiologists and in obstetric cases it's done by obstetricians. This always involves some delay in the ultrasound examination. Even in developed countries, it is underused. In a recent report from California, only 34% ED's reported use of bedside ultrasound. If a bedside ultrasound/echocardiographic machine is available it seems appropriate that it would be used often and finds application to a multitude of questions leading to early prompt diagnosis and treatment. Emergency ultrasound can be used as an extension of the clinical examination to rule in or rule out key diagnosis in specific clinical settings. This will also prevent future potentially life-threatening complications as seen in our patient. Emergency ultrasound is an imaging modality with a range of benefits in emergency medicine. It is rapid, safe, noninvasive and requires no contrast media or any special patient preparation. Benefits include earlier identification of life-threatening conditions and streamlined patient care. Patients with traumatic hemoperitoneum or abdominal aortic aneurysm may be accurately identified in the ED. Cardiac tamponade can be rapidly diagnosed and treated. There are two cardiac views, namely, subcostal four-chamber and parasternal long-axis views that are included in the focused abdominal sonography in trauma (FAST) protocol as part of the Advanced Trauma Life Support protocol developed by the American College of Surgeons. American College of Emergency Physicians have published 2008 emergency ultrasound guidelines. It is recommended that the following standard ultrasound windows (subcostal, parasternal and apical) and planes (four chamber, long and short-axis) are necessary to perform focused echocardiography when evaluating for cardiac activity and pericardial effusions with or without tamponade. In addition, they recommend training of emergency physicians to estimate global qualitative left ventricular function, estimation of central venous pressure through examination of inferior vena cava compliance to guide resuscitation in patients with cardiopulmonary instability, recognize a dilated aortic root and/or descending thoracic or abdominal aorta, recognize true cardiac standstill in the setting of cardiopulmonary resuscitation. It is recommended that a phased array cardiac transducer is optimal. If this is not available a 2-5 MHz general-purpose curved array abdominal probe, preferably with a small footprint, will suffice. The cardiac presets available on most equipment may be activated to optimize cardiac images. Doppler capability may be helpful in certain extended emergency echocardiographic indications, but is not routinely used for the primary cardiac emergency ultrasound indications. Even though, bedside ultrasound/echocardiography has the advantage of immediate availability at patient's bedside, simple to use and easy transportability, the formal echocardiography has few advantages. Two-dimensional imaging is superior on formal echocardiography, with improved image processing along with excellent color flow Doppler imaging resulting in accurate quantification of valvular regurgitation. A detailed evaluation can be done by an experienced echocardiographer or cardiologist including newer modalities of echocardiography like tissue Doppler imaging, 3D imaging leading to a more comprehensive haemodynamic assessment and a higher diagnostic accuracy. This case illustrates the importance of a screening focused ultrasound examination of involved systems by emergency physicians in detecting causes for emergency clinical presentations. In addition, this case stresses the need for a structured training programme for emergency physicians in ultrasound/echocardiographic examination especially in developing countries. 1. Keeling IM, Oberwalder P, Anelli-Monti M, Schuchlenz H, Demel U, Tilz GP, et al. Cardiac myxomas: 24 years of experience in 49 patients. Eur J Cardiothorac Surg 2002;22:971-7. 2. Pucci A, Gagliardotto P, Zanini C, Pansini S, di Summa M, Mollo F. Histopathologic and clinical characterization of cardiac myxoma: Review of 53 cases from a single institution. Am Heart J 2000;140:134-8. 3. Chakfe N, Kretz JG, Valentin P, Geny B, Petit H, Popescu S, et al. Clinical presentation and treatment options for mitral valve myxoma. Ann Thorac Surg 1997;64:872-7. 4. Pinede L, Duhaut P, Loire R. Clinical presentation of left atrial cardiac myxoma. A series of 112 consecutive cases. Medicine (Baltimore) 2001;80:159-72. 5. Stein JC, River G, Kalika I, Hebig A, Price D, Jacoby VL, et al. A survey of bedside ultrasound use by emergency physicians in California. J Ultrasound Med 2009;28:757-63. 6. McLaughlin R, Collum N, McGovern S, Martyn C, Bowra J. Emergency department ultrasound (EDU): Clinical adjunct or plaything? Emerg Med J 2005;22:333-5. 7. Kortbeek JB, Al Turki SA, Ali J, Antoine JA, Bouillon B, Brasel K, et al. Advanced trauma life support, 8th edition, the evidence for change. J Trauma 2008;64:1638-50. 8. American College of Emergency Physicians Emergency Ultrasound Guidelines 2008 policy statement. Available from: http://www.acep.org/WorkArea/DownloadAsset.aspx?id=32878 and Available from: https://www.acep.org/WorkArea/DownloadAsset.aspx?id=32886. [Last accessed on 2010 Aug 22]. 1 Diagnosis in a Heart Beat, or Focused Echocardiography: How Should it be Used in the Emergency Room? Kuteyeva, O. and Labovitz, A.J.